Arsenal manager Arsene Wenger has defended his decision to field an entire squad without an English player in the 5-1 win against Crystal Palace. Wenger fielded the first foreign 16-man squad in English football history because Ashley Cole was ill and Sol Campbell was out injured. 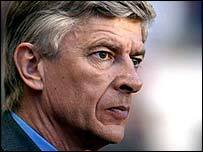 Wenger said: "I didn't know about that until I was told about it. "I don't look at the passport of people, I look at their quality and their attitude." Wenger joked: "England boss Sven-Goran Eriksson was here, so who did he watch then? Has he signed for a different country?" In reality, Wenger had few alternatives, given that Justin Hoyte was injured and Jermaine Pennant is on loan at Birmingham. Ryan Smith is still a teenage prospect and Stuart Taylor is the third-choice goalkeeper. But it still confirmed that many of the club's exciting youngsters having been recruited from abroad. Their 16-man squad against Palace featured six Frenchmen, three Spaniards, two Dutchmen, one Cameroon international, one German, one Ivory Coast international, one Brazilian and one Swiss national. At Arsenal, meanwhile, only Cole has come through the ranks to become a first-team regular in recent seasons, although Matthew Upson has played for England since moving to Birmingham.